← How Long Should a Blog Post Be? You may think it rather odd that I’m writing about the failure rate of spam emails. Well, the reason for my madness is that you can learn a lot from the spammers about how not to do email marketing. When you send out emails to potential clients, do you think carefully about your subject lines, presentation and content before hitting send? I’m not going to go into detail about how to make your email marketing work, if you follow that link you’ll find a post that tells you all about that, instead I want to take an example of a spam email and highlight the areas the sender has got wrong. You see if you get the same areas wrong your emails could end up looking like spam and that’s something you want to avoid at all costs. Here’s the email – I have blanked out names to save blushes. Before I talk about the areas you can see, I would like to point out that although this apparently came from a company, the email was a gmail.com address. If you are a legitimate company you should have a company specific email address, i.e. Joe@velocitylighting.com not velocitylighting@gmail.com. The first thing I want to look at is the subject line. 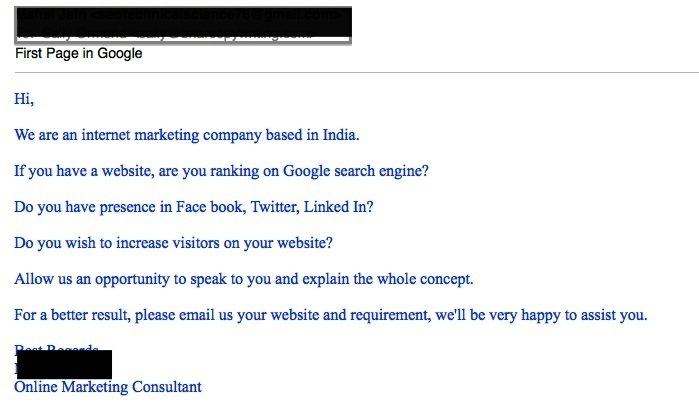 This sender has used “First Page in Google”. First off no one can guarantee a first page ranking in Google, so instantly, I can smell spam. It’s not a descriptive subject line either; it doesn’t entice me to click on it to learn more. If you want people to open your emails your subject line must grab their attention. That shows this is a blanket email they’ve sent to all and sundry. When sending out your email campaign make sure you address the recipient my name. This should be easy because you’ll be using your own list rather than a random one you’ve bought in (won’t you?). It may seem a small thing, but addressing someone by his or her name will go a long way to build trust. Then we get into the body of the email. Again, you can instantly see this email is a blanket mailing because it’s asking if I have a website, is it ranking, do I use Facebook, Twitter or LinkedIn? Again, if they knew me they’d already know the answers to those questions. They then go on to ask for the opportunity to speak to me and explain the whole concept. What concept? Using Facebook, Twitter and LinkedIn? Increasing visitors to my website? There are so many issues it’s impossible to know exactly what they’re offering because there is no focus. The most powerful emails (landing pages, web pages etc.) focus on one idea. Any more than that and you begin to dilute your message. How can I email them my website? I can email the URL, but not the physical website. Plus, this again shows they have done no research whatsoever on my business, because if they had, they’d know my web address. Last, but not least, look at the signature at the bottom. I know the sender is an Online Marketing Consultant, but I have no idea from which company – no branding – yet another epic fail. Hopefully, looking at this obvious spam email has helped you understand more about how email communications should be written and the pitfalls you must avoid if you want to be taken seriously.